Are We Sheep, Content To Lick The Side of The Road – or Do We Stand and Deliver Our Destiny? Big Horn Sheep on the Icefields Parkway ©2012 Janice Tanton. The Icefields Parkway starts to get well-travelled at this time of the year. It’s still a barren stretch of road, devoid of the average “touristy” stops, cell connectivity and roadside gas stations. You’re bound to see some form of wildlife almost any time of the year in this high country. 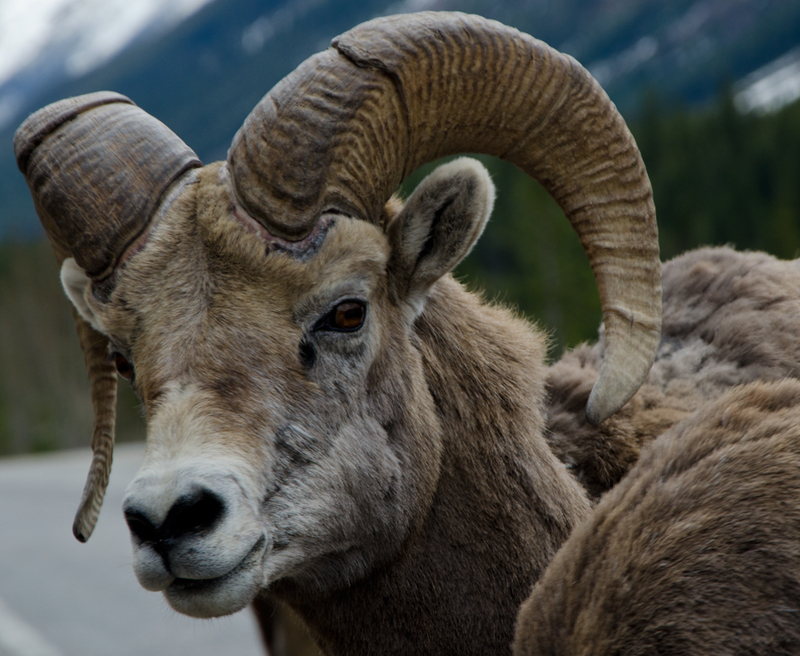 More often than not, you’ll see Rocky Mountain Sheep vs. the Bighorn Sheep that you see above, but nonetheless….both will cause a jam on the highway as tourists from all over the world stop to catch their fill of a bit of wild “Canadian” through the lens of the glaciers, the mountains and the Columbia Icefield. Hell…as taxpayers, we’ve sure marketed it! I’ve always said it’s the most beautiful road in all of Canada and drank that Koolaid…until today. Today, I found a less-travelled path by the common North American, Japanese, Chinese and European tourists that so often are now found along the stretch from Banff, Lake Louise and Jasper. The Icefields Parkway seems but a cheap touristy trinket version of “Canadian Wild”, eh? Today…I found the road from Smithers to Terrace, and THIS is the most amazing piece of road that I have yet seen in all of my life. Wide areas of timber, rivers that flow with strength and purity one into another – of every colour and size, culminating in the Sacred Headwaters of the Skeena River. Wow. And until yesterday, I thought the Bow River was something to behold, but the Skeena has a power and life-force beyond comprehension and words. My friend, Rob Buffler talked about the Skeena over coffee last week. His eyes lit up with fever and wonder…and I would not have understood it until I saw it for myself. 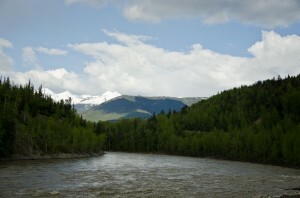 The Skeena River ©2012 Janice Tanton. The verdant valleys that lay at the bottom of majestic snow-capped peaks that line the sides of the Yellowhead highway #16 westward towards Prince Rupert…have taken my breath away today. The smell of the air is different here. It’s newer – fresher, filled with spirit and the life-breath of the trees. The life-breath of this planet. I get it. I get why we need to look at this land with different eyes, and protect it. I’ve never seen anything like it. Pristine…beautiful. There are no words for this place…and there are fewer people to see it. I travelled for hours today, only sighting a few logging and industry trucks and a camper or two amongst them. The tour companies don’t come here…it’s too far, too remote, but it’s important. We need to see this place. 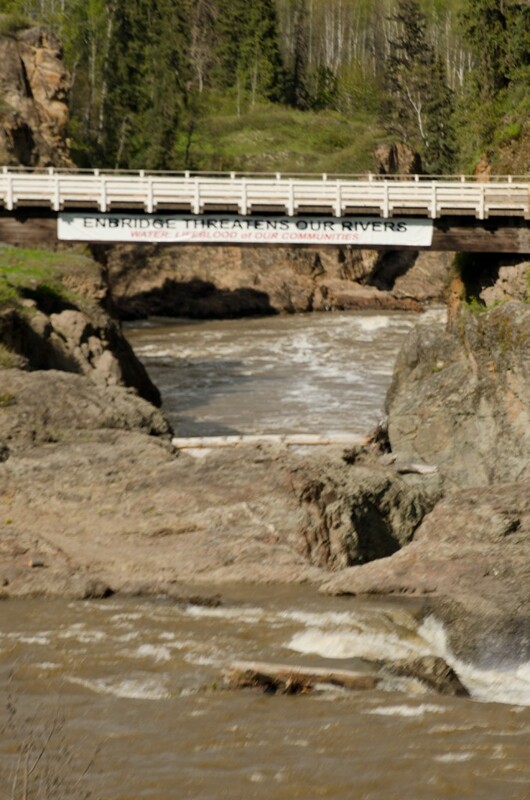 This is the place that the proposed Northern Gateway Pipeline (and a warning- that’s the link to Enbridge’s point of view of this) will pass through. It is almost as though this remote place doesn’t matter because the majority of folks never see it. This is just not true. It matters. Oh…how incredibly vibrant and alive this place is. I do not think we can afford to even take a small chance to ruin such a thing. It disrespects the Creator. It disrespects us. It disrespects everyone that came before us and everyone that will come after us. We really need to rethink this. Speak up. Spread the word. This land is important. I despair that my children, and their grandchildren may never see such things as I’ve seen today, and I am not a sheep, content to lick at the side of the road while the tour companies plan the stops and the tourists jump from their busses, cameras in hand to catch a sheep licking the road. I don’t want to see that type of “managed” wild. It’s just not real…not living…not “us”. I will not be that sheep. There is something much more powerful stirring within me. This is the time for us all to become more like the bear – to travel far and wide and see what our territory is, beyond our comfort zones, beyond our daily lives and into the life we are all so deeply connected within. We cannot lose this….or can we? Get involved. Find out what the issues are for yourself. Question and understand every viewpoint, and then voice an educated opinion.